A 2017 green bridge survey identified cereal leaf rust, spot type net blotch, wheat streak mosaic virus and aphids. These detections highlighted the importance of managing the green bridge to reduce the impact of these pests and diseases on planned cropping programs. To identify the diseases, aphids and viruses being hosted by green plant material following summer rainfall. The summer rainfall event that fell across all Western Australian agricultural areas in February 2017 germinated weeds and volunteer crops. The green plant material over summer between harvest and seeding is known as ‘green bridge’. It can act as a host for pathogens and pests enabling them to survive the summer and infect crops early in the growing season. A survey of 69 sites was conducted across the WA broadacre farming area from February to April 2017 (Figure 1). Diseases found included rust, net blotch, yellow spot, cereal powdery mildew, as well as aphids and viruses. Collect green leaf samples of cereal, canola and radish plants, and separate aphid samples. Samples were collected from cropping paddocks and roadside verges. Submit leaf and aphid samples for virus testing at DPIRD Plant Virology, South Perth. Plants with rust, net blotch, yellow spot, and/or cereal powdery mildew were also sent for laboratory confirmation at DPIRD South Perth. Rust samples were sent to University of Sydney’s Australian Rust Survey for pathotyping. Collect soil core samples from the Esperance, Albany and Kwinana West port zones for identification of soil-borne pathogens by the Predicta B® DNA-based soil testing service. Predicta B identifies soil-borne pathogens. Early detection identifies risk of potential yield loss from plant root diseases crown rot, rhizoctonia, root lesion nematode and take-all. Samples were prepared and sent to South Australian Research and Development Institute (SARDI) for analysis. A summary of samples submitted for testing from each port zone are listed in Table 1. Barley and wheat leaf rust was confirmed in samples in the Albany and Esperance port zones. Aphids were present and collected from seven sites and a range of other pests and diseases were detected, including locusts mainly through the central wheatbelt. 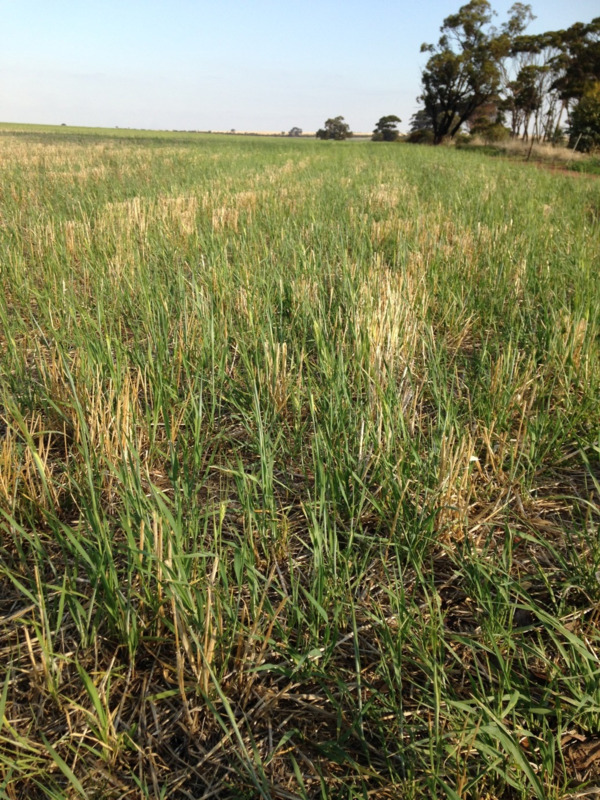 Limited samples were collected from the Geraldton and Kwinana East port zones due to low level or absence of green bridge, either through limited summer rain or early management of germinations. The incidence of pests and disease detection is shown in Table 2. Of 28 cereal sites tested, there were four cases of wheat streak mosaic virus (WSMV) found at Corrigin, Albany, Neridup and Cunderdin. One canola site at South Greenough (south of Geraldton) was positive to beet western yellows virus, out of 13 sites sampled across the state. No barley yellow dwarf virus (BYDW) serotypes PAV, MAV or turnip mosaic virus (TuMV) was identified at any of the 41 sites across the five port zones. Although these viruses are not generally a problem in WA crops, continued monitoring is important. BYDV has been a problem in cereals in the past but changed farming practices have reduced its incidence. Serotypes PAV and MAV are tested as they are spread more efficiently by different aphid vectors. TuMV is found in canola in New South Wales and is monitored for presence in WA. Predicta B® testing of twenty five soil samples detected DNA of three root lesion nematodes (RLN) species (Pratylenchus neglectus, P. teres and P. thornei) and of pathogens that cause take-all, rhizoctonia and crown rot. Predicta B® results for root lesion nematodes (Table 3) and fungal root disease pathogens (Table 4) are reported as not detected (ND) and low, medium or high disease risk. In this green bridge survey, rust and net blotch on cereals, locusts and aphids were the main pests and diseases detected in initial testing. A medium or high risk of RLN species was reported in 50% or less of samples — 13/25 (P. neglectus) 4/25 (P. teres) and 1/25 (P. thornei) samples across the Albany, Esperance, Kwinana West and Kwinana East port zones. For fungal disease pathogens , a medium to high risk of take-all, rhizoctonia and crown rot was found in 12/25, 8/25 and 5/25 samples respectively. The results from this green bridge survey were reported to the PestFax database, thereby contributing to overall picture of the threat of crop disease across the WA wheatbelt. The detection and reporting of such pests and diseases prior to seeding can alert growers and industry to their presence/absence, increase growers awareness of the potential risk these diseases may pose during the coming season and enable them to implement appropriate management strategies. Sample collection was undertaken by: Jolie Delroy, Edwina Cockburn, Alice Butler, Emma Clarke, Ciara Beard, Bec Swift, Stacey Hansch, Kylie Chambers and Adrian Rossi (DPIRD). GRDC Project Number: DAW00256 Building crop protection and crop production agronomy research and development capacity in regional Western Australia.